Primula (Primula spp. ): growing, planting, caring. An easy and hardy flowering plant - with flashy colours! Scientific name : Primula spp. Primula is a genus of mainly herbaceous flowering plants in the family Primulaceae valued for their ornamental flowers. Species include P. vulgaris, the familiar wildflower of banks and verges known as the primrose, P. auricula, P. veris -the cowslip - and P. elatior - the oxlip. Most are perennials growing 10–30 cm (4–12 in) tall, with a basal rosette of evergreen leaves 5–25 cm long, often heavily wrinkled, and flowers a wide variety of colours. 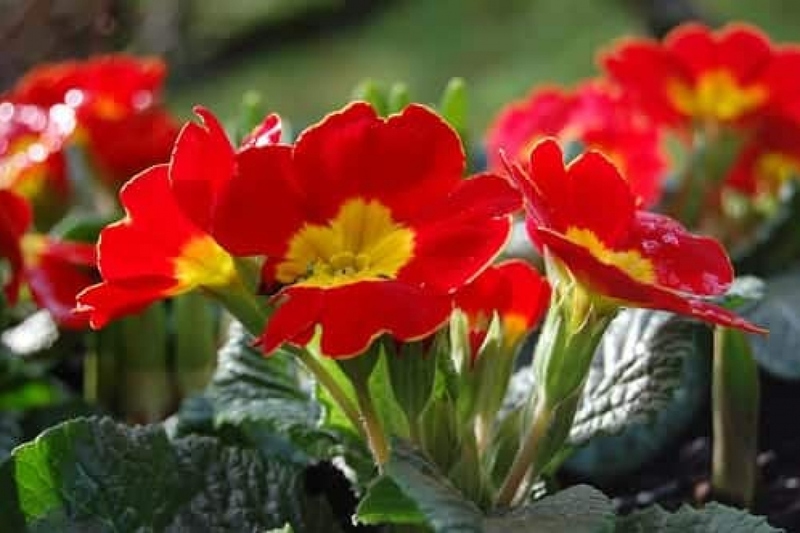 Primrose, or Primula, is a genus of herbaceous plants of the Primulaceae family, perennial often grown in annual. This genus, to which Cortusa, Dionysia, and Dodecatheon are now associated, includes several hundred species, mostly from the temperate zones of the northern hemisphere. The Common Primrose is one of the first flowers of spring (primo vere means early spring in Latin). It flowers from February to May, is hardy and has semi-evergreen foliage. Plant from October to March. Primrose generally prefers a semi-shaded location - in all cases a non-burning exposure. It likes humus soils, fresh, light and well drained. If the soil is heavy, add a little sand to lighten it. Prepare the soil by digging (to decompact without necessarily turning it, with a fork or a grelinette), then scratch and rake. Add an amendment if the soil is not very rich. Plant primroses spaced 1/3 of adult height between plants. Thoroughly tamp the soil not to leave air in contact with the roots, then water abundantly. Water well for a few weeks after planting, especially if it does not rain to ensure a good recovery. Then you should only water in the summer in case of heat and drought. Seeds and seedlings should be watered gently. Keep the seedlings permanently moist to make them germinate, and gradually decrease watering rythm while increasing inputs' volume: plants develop a better root system if they have to fetch the water deep. Primroses are easy - but you can give them a boost by spreading compost during winter, or well-decomposed manure at the foot of the plants. You can sow primroses - harvest the seeds to sow the next season - but the breeding by division of the tuft is a good idea: it lengthens the vigor of the plants. Every 2 years, extract the stump just after the flowering using a pitchfork. Separate chips with 1 or 2 small rosettes and replant immediately the plants at least 30 cm apart. Watch out for: gray larvae of otiorrhynchia feast on roots and leaves. Eliminate the soil stuck to the roots to detect their presence, and get rid of them if necessary. Slugs and snails are fond of young shoots of primulas. They pierce and cut foliage, consume sprouted seeds, seedlings, foliage and green waste. If you see any, install beer traps or ash barriers.